Sometimes it feels like it never ends. But nonetheless, another day has brought forth another chapter in my struggle to have a perfectly working car. So let's get down to it. 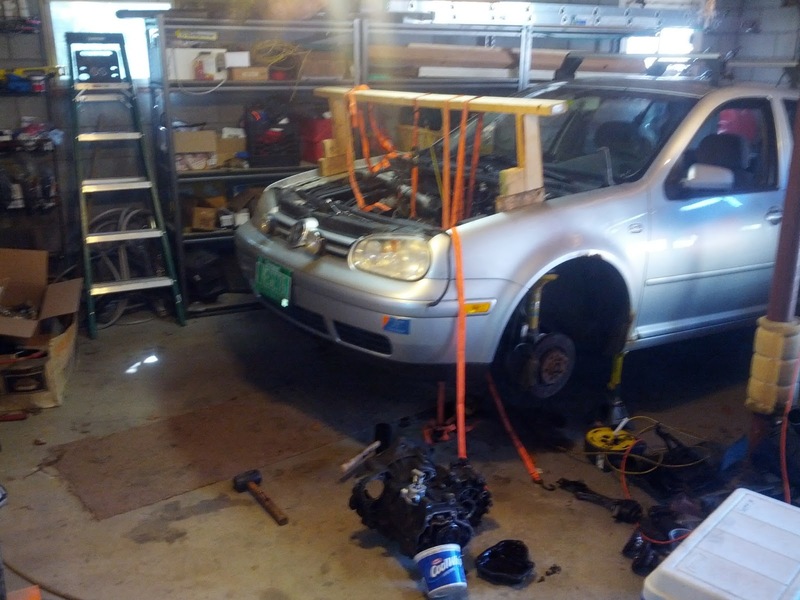 In short, the bearings in my VW Golf TDI transmission are shot. Most likely all of them are, but certainly the tapered roller bearings for the differential output shafts. This is responsible for excessive play, which in turn causes the seals to fail. Between having a baby (it's a boy, and everyone is doing great! ), and other challenges, I haven't had much time to deal with it, much less write a blog post. Thankfully, the Probe has been running awesome, and most of my driving has been around town as I have been on family leave anyway. A couple of weeks ago, after weighing my options, I decided it's still worth the pursuit of fixing my car myself. To purchase a new transmission or have this one rebuilt, plus the labor of removal/reinsertion, plus all the crying I'd have to hear about my veggie stuff in the way, I'd rather just do it myself (actually, what I'd love to do is get a new car, but that's not going to happen this year for financial reasons). Now that it's summer, the pressure is kind of off me anyway. I found a 2000 Beetle TDI transmission, reportedly with ~100,000 miles, on eBay for $700. It appears to be in beautiful cosmetic shape in the pictures, an attribute that I am not naive enough to base any assumptions about the quality of the internals on, but one that doesn't hurt, nonethless. Downside: It's a DQY coded 02J transmission. Officially it doesn't fit in a 02 Golf TDI, but after viewing a couple of posts on vwvortex.com and tdiclub.com, I believe it's totally possible - in fact, probably rather easily done. The only difference is apparently the shift linkage, and since I will be scrapping my old transmission, I transfer whatever parts are needed over to the new one. At worst, this would be the entire shift tower, an item which is fairly easily removed and replaced. The transmission is on its way. In the meantime, I've managed to squeeze in just enough hours to pull out my old transmission. I built a beam hoist out of wood and ratchet straps. Slowly and thoroughly walked through the steps of removing everything, and gently lowered it to the floor. It went pretty smoothly, although as I recall, getting it out is the easy part. Getting it in is the hard part.